After major coverage expansions of the Affordable Care Act are implemented in 2014, about 20 million people are anticipated to stay uninsured. The number of uninsured individuals is expected to reach an all-time low after reforms on the national health system are implemented. However, millions are still expected too remain without health coverage even after major reforms are implemented starting 2014. With an additional 30 million people joining the health care system over the next few years, physicians can have more opportunities to treat more patients. However, unintended problems are also expected with this increase. With more people getting health insurance, demands for healthcare are expected to rise. This will bring increased reliance on nurses, physician assistants, medical technologists, and other allied health professionals. This may result to scope-of-practice conflicts among health care workers, as physicians continue to deny non-physician attempts to practice medicine and non-physicians continue to assert themselves. In 1987, the total number of uninsured individuals was 31 million. Today, it is estimated at 50 million. The number is expected to go down to about 20 million in 2021. A part of the 20 million uninsured individuals is already known. These are the people who do not have any coverage for the same reasons they do not have one today, such as being illegal residents. Illegal immigrants will not be qualified for Medicaid. The estimated 4-7 million illegal immigrants are also prohibited from purchasing health insurance coverage in the exchanges, even if they buy with their own money. About 3 million nonelderly people will be given mandate exemption for earning less than the tax filing threshold ($9,500 for individuals and $19,000 for couples in 2011). According to Urban Institute, a few million people will also be exempted based on insurance cost relative to their income, or for being out of insurance for several months. 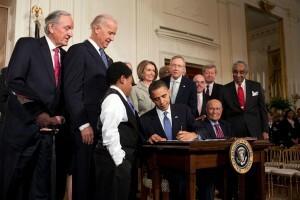 Encouraging people to stay covered is one of health reform law’s individual insurance mandate. Its effectivity will have a big influence on the number of insured individuals. About nineteen percent of the nonelderly are uninsured. The reform law is projected to lower that number to 8.3%, according to the Urban Institute study. Without this mandate, the number will be about 15%. The health insurance exchanges scheduled to start in 2014 will have several functions. They will set an avenue for people to connect with new individual and small group health insurance plans, and also with Medicaid. They can also offer new group health insurance choices. The reform law offers incentives for firms who offer coverage through these exchanges. Employers are not required to offer health insurance to their workers. However, some bigger firms will have to pay penalties if their employees get subsidized coverage through the exchanges. State governments have their own guidelines on health insurance coverage implementation. They will also make sure that physicians and other health professionals are working in the most effective way. Decisions by states will play a major role on the number of individuals who stay uninsured or those who get coverage but lack access to care.